Although he only debuted in the Stars Wars franchise in 2015, cute-as-a-button BB-8 has already won over the notoriously difficult to please fan base. The spherical droid newcomer is now right up there with R2-D2 and C-3PO as a true icon among loveable cinematic robots. Audiences are loving his quirky, childlike personality and fierce sense of loyalty. And it appears the rotund robot also has impeccable manners, as shown during his recent appearance at the Royal Albert Hall, London. All the big names were out on the red carpet for the cinematic event of the season – the European premiere for Star Wars: The Last Jedi. And, of course, BB-8 was there to steal the show, rollin’ around the red carpet and quite literally having a ball alongside his fellow actors. 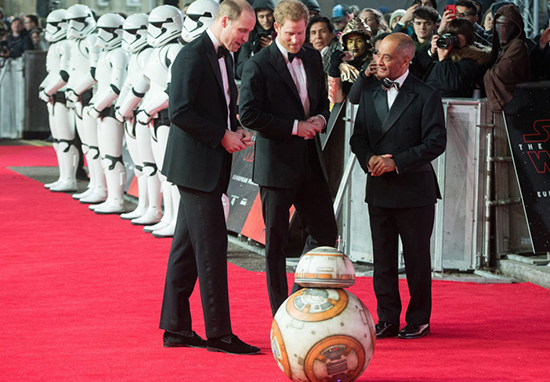 However, fans just couldn’t believe it when the sweet, bowling-ball shaped droid bowed before Princes William and Harry as he greeted them. Wills and Harry laughed with delight at the polite gesture. Clearly BB-8 has welcomed them as members of the resistance. 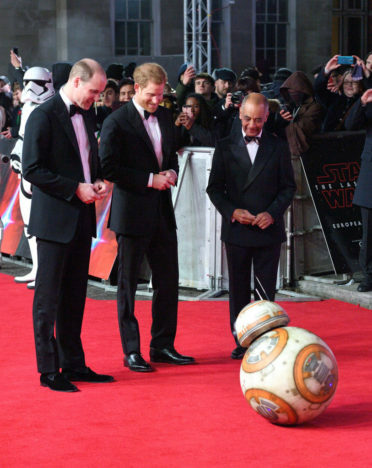 BB-8 chattered and chirped excitedly as he caught up with his Royal friends. The two Royal Highnesses appear to be big Star Wars buffs, and will no doubt be chuffed to bits with this regal encounter. The Force is strong on this red carpet! During a tour of The Last Jedi film set last year, the brothers got to muck about with lightsabers to their hearts content, and Wills confessed to being a ‘total Star Wars geek’. The Duke of Cambridge even managed to sneak a cuddle from Chewbacca, which I imagine would have been the snuffliest of hugs. Both princes appeared as Storm Troopers in this latest installment of the space odyssey. It is thought they made their cameos in a scene where Boyega and Benicio del Toro are trying to infiltrate an enemy base, only to get captured in a lift. When William and Harry appeared at the premiere, they were presented with their very own storm Trooper helmet – handed to them by 12-year-old Lily Chambers and eight-year-old Eloisa Lerner, the daughters of Disney executives. The princes appeared to be especially pleased to meet Luke Skywalker himself – 66-year-old Mark Hamill. Everywhere I go people are helping me deal with it. I shouldn’t be upset she’s not around, I should be grateful for all the time I had with her. She was hilarious, adorable, as tough as she acted she had a vulnerability; I criticised her all the time but if anyone else did I’d get my back up and say ‘Don’t you do that’. She was so much fun. She’s great in the film. The Last Jedi premiere was hosted in aid of The Royal Foundation, with over 400 young people, military veterans and volunteers in attendance. The question remains: will BB-8 be getting an invite to next year’s Royal Wedding?